The set of A Christmas Carol behind us. Love that my husband enjoys plays too! Nothing kicks off the Christmas holiday season quite like the story of Ebenezer Scrooge in Charles Dickens’ A Christmas Carol. So it was quite wonderful to attend the play presented at Meadow Brook Theatre in Rochester (on the campus of Oakland University). Justin and I took my mom, joined by two friends, to see this play that tells the well-known story of Ebenezer Scrooge’s path from cranky, selfish, rich man to life-loving, generous, friendly chap, thanks to visits from three ghosts – the Ghosts of Christmas Past, Present and Future. I was hooked from the opening number that was filled beautifully dressed carolers singing Christmas songs. The costumes were fabulous and perfect for each part of the play. The set helped define the mood of each scene. The stage was impressive – part of it rotates in a circle so the actors can ‘move’ to different areas, such as Scrooge’s office and bedroom, the Cratchit’s home and the town’s sidewalks. I caught myself smiling quite a few times at the festivities on stage, from the dancing and singing to the funny actions and comments of different characters. While all of the actors were good, the actor playing Ebenezer Scrooge was fantastic – he embodied the quirky traits and attitude that you expect this character to have. The play is just under two hours, with a 15-minute intermission. It keeps you captivated so time really flies by. One note on seats: Fog is created during several acts and we noticed much of this fog drifts to the first few rows so be prepared to be engulfed if you sit close to the stage. There are quite a few dining choices located within minutes of the theater. 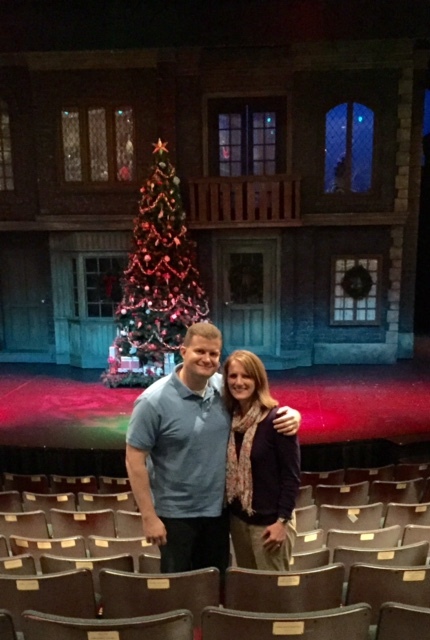 A Christmas Carol is live on stage at Meadow Brook Theatre through Dec. 22, 2014. Tickets are available at the box office, via phone at (248) 377-3300 and Ticketmaster.